Look 3: Patterned Wedges – Patterned wedges are major this spring and they’re a fun and easy way to add a pop of color to any look. 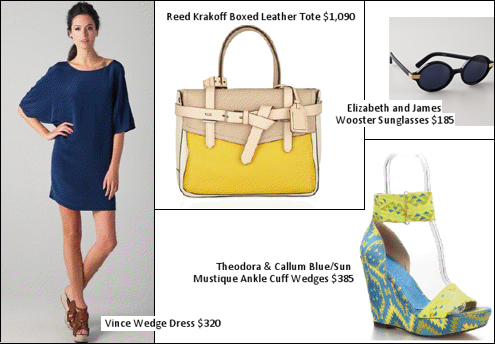 I love the Theodora & Callum Blue/Sun Mustique Ankle Cuff Wedge and the great thing about them is that you can be daring and mix with another printed item like a dress or top, or keep it simple with a solid like this Vince Wedge dress. Another must have for spring is an oversized bag. I love the color blocking on this Reed Krakoff Boxed Leather tote, it ties everything together without being too matchy. Finish off the look with uber trendy oval sunglasses, like the Elizabeth and James Wooster frames. Stefani Greenfield, co-founder of Scoop and Founder and Owner of My Next Act, a consulting company focused on fashion and entertainment has a serious passion for fashion. After years of running Donna Karan’s DKNY line and moving on to be Esprit’s Vice President of Merchandising, Stefani decided to switch the corporate gears and open her own “Ultimate Closet” which we know today as Scoop. Now in over fourteen stores nationwide, with partner Uzi Ben Abraham, Stefani Greenfield gleaned the best of high and low fashion, ready-to-wear with undiscovered talent, and the clean tailoring of a sensual bohemian. Stefani is the co-owner of Theodora & Callum, an accessories brand with partner Deiree Gruber, and in November 2011 Greenfield was named Chief Creative Officer of The Jones Group. Stefani is a co-founder of Love Heals, The Alison Gertz Foundation for AIDS Edication and a Board Member of Baby Buggy.